Let’s face facts. Most online content is lousy. It’s too focused on the content creator. It doesn’t make the lives of readers, listeners, and viewers better. An overcrowded content marketplace filled with diverse online text, audio, and video leaves little room for tolerance of the same old marketing spiel. Bored surfers simply hit the back button and go elsewhere to find interesting content. To succeed, you need to provide value that rises above the noise. How do you do that? To make your content marketing engaging, you have to temporarily quit thinking (and writing) like a marketer. Instead, think like a journalist … specifically, like a trade journalist. An embedded journalism approach gets you to change gears, to switch your focus to truly serving your readers. Service is the operative word, a concept discussed as a core online strategy in Welcome to the Fifth Estate. Businesses and organizations that make a commitment to serving their customers with great content — just as they commit to providing a quality product — initiate interest and build loyalty. They offer value where others simply offer PR messages thinly veiled as blog posts. Does any of this sound familiar? It should — it’s the content marketing strategy Copyblogger has been using and teaching since 2006. Build your authority and reader engagement by creating content truly worth reading, and the benefits will follow. Most trade journals and top-tier blogs have editorial missions. The editorial mission provides a compass, always guiding writers toward relevant subjects. What do you stand for? What do you offer customers and readers? Every company has unique knowledge it can share with customers. Understanding the middle ground between your company and the customer opens the door to value creation. All trade publications have someone who serves as a managing editor. The editor finds intriguing stories, shapes and improves them, and ensures that they come out on time and meet the publication’s quality standards. You need to become your site’s managing editor. That means developing regular content. Frequency and consistency build a core readership. Quality engages core readers, builds loyalty, and can result in content-sharing. Producing quality content means not cutting corners. It means delivering your best post every day. WNBA Houston Coach Kevin Cook said, ““You’re only as good as your last game, and our last game was pretty doggone good.” You should feel the same way after every item of content you deliver. If you don’t have the talent to create regular quality content, find it. Plenty of former journalists and bloggers with domain knowledge would be delighted to help you out for a reasonable fee. In addition to advertising and subscription fees, most trade publications sell value-added content like special reports, webinars, and conferences. The online versions are, of course, ebooks, membership sites, and virtual conferences. Trade publications promote these services. But they don’t forget what their readers come to them for … their bread-and-butter high-quality content. We all need to market. When you have a new product or service that customers will find valuable, you have to tell them about it. And it only makes sense to use calls to action to motivate customers to further engage and buy. But there is a balance to these things, an ebb and flow. If you’ve created continuing value by providing a steady stream of distinct, interesting content, your community will be more receptive to your marketing … with open minds and wallets. 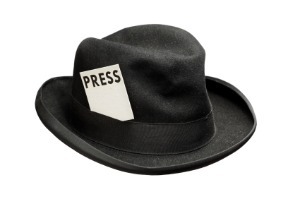 Do adopt a trade journalism mindset to provide regular, valuable information. This is online marketing that works. Boring and useless? Not so much. About the Author: Geoff Livingston co-founded Zoetica, and is author of Welcome to the Fifth Estate: How to Create and Sustain a Winning Social Media Strategy. The Genesis Framework from our StudioPress division empowers you to quickly and easily build incredible websites with WordPress. With search-optimized code and functions, 37 turn-key designs, and unlimited support, updates, and websites you can build, Mashable calls Genesis the “best of the best” among premium WordPress theme frameworks. It’s no wonder over 46,465 online publishers trust Genesis to provide a solid foundation for their sites. Whether you’re a novice or advanced developer, Genesis provides the secure and search-engine-optimized foundation that takes WordPress places you never thought it could go. Find out more about StudioPress here. Geoff Livingston is an author, public speaker and strategist who helps companies and nonprofits develop outstanding marketing programs. He brings people together, virtually and physically for business and change. I love #3. There seems to be a certain point at which more marketing gets you fewer results than if you marketed less. Seems counterintuitive, but I guess there’s only so much attention dudes are willing to give you around here. Indeed. It’s the old saying, “You’re trying too hard.” And so it is! If you think about it… you also need to entertain. Really looking forward to more IMSP podcasts. Your colleague Robert does a very good job, btw. I’ve never thought of writing a blog post in a journalistic way! But it’s a great idea! I might try that in my next posts and see how it’s received by my readers! I find this really works for more conservative organizations that struggle with personality and moving away from business speak. Trade associations, older nonprofits, big companies and some government orgs seem to like this. One of my favorite examples of this is the Rubbermaid blog. We just started a similar initiative with Razoo. I set content goals to make everything I publish interesting and useful. I want those who come to my site to be able to read what I write and actually make it to the end of the article, or maybe two or three, without feeling like blah. It’s a little harder for me to make some of my content interesting because of the content topics, but I have made some improvements with it along the way. Points 1 and 2 are so key for me……especially about not cutting corners with producing quality content. I feel like sometimes I have to hurry up and get a post done because its been a day or two since I last published a post, but I keep reminding myself it’s about quality not quantity! It’s the most important thing. Memorable content is not that common. Mediocre content is. So publishing once or twice less times a week to focus on quality can make a big difference. Regularity, though, is also important. No one wants their writing to turn in a “Chinese Democracy” like project. I suppose it is a balancing act. Thanks for the great comment! I like the editorial mission idea. Every business should have that for all their content. Content published on multiple platforms should all hang together, be the voice of the business, and share interesting, useful information that appeals directly to the readership. It certainly helps you from going astray. At the same time, it’s god to throw a wild card in now and then. Rules are made to be broken periodically. A healthy trade journal will have promotions as 50% of their pages, both with their oqn stuff and third party stuff. Also the back pages are reserved for classifieds – pages and pages of offers. As a Variety and Hollywood Repoter reader, I welcome these super targeted, high quality ads. So, don’t be afraid to “overmarket” necessarily. If the offer is good, and the marketing isn’t obnoxious, people won’t mind. That’s a good and really interesting point, Hashim, thanks. Mmm, but how many of these are other party ads versus their own promotions? Let’s factor that in, too. I think people expect and tolerate ads in trade pubs, but they also tend to ignore them, too. Great idea. I think standing for something and using that to direct content is huge. Thank you. Another aspect to this approach is that journalists – well, at least the popular image we have of journalists – are very on-the-street. One-on-one with people. Experiencing things as they’re experiencing them. When you’re in that mode, it’s hard to BS or prattle. You’re almost required to stay direct and focused. Much easier to create quality content then. Exactly. And many top bloggers are also former journalists. That’s no coincidence. Thank you for commenting! One thing that hasn’t been mentioned yet about journalist based content is that usually it involves photos. As a freelancer for many years for newspapers and a trade magazine, editors loved it if you could also supply photos. Often it was required to get the job. Why? Photos both draw the eye and help with initial engagement and they also help with retention because the piece doesn’t look like one big long dissertation. The same idea applies to blogs as well. Add photo ideas, what kind and who’s going to get them into your editorial calendar/plan so it’s easier to remember to do it. I think there are plenty more that can be put into this list to make it more of a 10-step cure though. For example, providing your reader with different types of content. Infographs, videos, webinars, interviews, etc. I think supplying the same formatted article every day will get boring. No. 2 is the clincher, for sure. Nice post, Geoff. People doesn’t care about what your offer is. Remember the favorite radio station of every people is W.I.I.F.M. The content should be focus on the benefits of the readers. They visit our blog for answers to their needs. Great list. I really struggle with #3 – but you’re right. As I’ve focused on creating higher quality content for my audience, the community has done the marketing for me. Great and timely post! You have a very interesting and good thought about the cure of boring, useless content. But we should put in mind that prevention is better that cure. I think #1 is at the heart of the issue (and perhaps all you need). If your mission is something simple like ‘be useful to our readers’ then that will guide #3 (and perhaps #2). If your readers would find a particular offer useful then it’s a good idea to mention it in context. If endlessly banging on about it gets in the way of writing the tips they came to your site for then you’ve failed in #1 and #3 goes without saying. I’m going to formalise my ‘Content mission’ right now… thanks Geoff. Much of my later posts are greatly influenced by what I learned from Copyblogger. Thank you for all these ideas and learning. Among the three steps, it’s on the aspect of marketing that I’m inept. I’m still struggling with time management, marketing takes a lot of time. Again, thank you for this helpful post. No. 2 is very important. But creating quality content on a daily basis is quite difficult and needs a lot of time. Good post though. I am taking the editorial mission to heart and plan to have one online before the week is out. Thanks! I think bloggers should rid themselves of the idea of daily posting as a blog building strategy. It’s one of the reasons for quack contents all over the web. You mustn’t post everyday to build a great blog. Concentrate on quality.. These are great guidelines. I resonate with #1 – keeping a strategic focus on what content is being published. In our case, if it isn’t *something* having to do with helping someone learn, understand or better use WordPress… it’s not published. If we do find something that may be slightly off topic, but within the realm, we’ll may share that on our FB fanpage as our guidelines are a little looser there. This is very good site for copywriters and bloggers. I love to read it, i am new here. I have few question in my mind PLZ answer. 1) Is it save to use Youtube videos on my blog, are youtube videos come under public domain? 2) Are images from images.google.com with no watermark come under public domain? 3) If not then how I get videos and images under public domain that are free for use ? No, just because a video is on YouTube does not put it in public domain, nor is everything on Google images in the public domain either. All content is created by someone and that person owns the copyright. Even if they display it publicly for people to see/read, doesn’t mean it is free for other people to use as they wish. Think about it in terms of an art gallery. People hang paintings on the walls and place sculptures on pedestals for visitors to see, but that doesn’t mean anyone can simply pick up a painting and take it for his/her own use. It would need to be purchased, or borrowed etc. If you want to use anything online whether it is text, photo or video, you need to get permission. It is up to the person wanting permission to ask for it, to figure out how to get it. Some people give a general permission to use something as long as you attribute the original creator. There is also a creative commons agreement that lets people use photos for example, without extra permission and often for free. Flickr.com is one place to find such photos and Wylio.com offers many as well. I’m not sure about such a source for video.